← My Favorite Beer ! 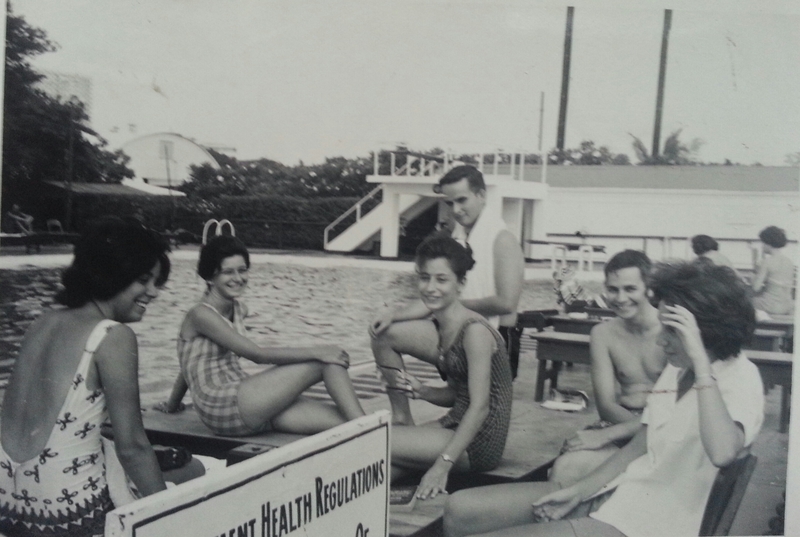 Recently I’ve seen posts on my Facebook site “Manila Nostalgia” that have truly disturbed me. 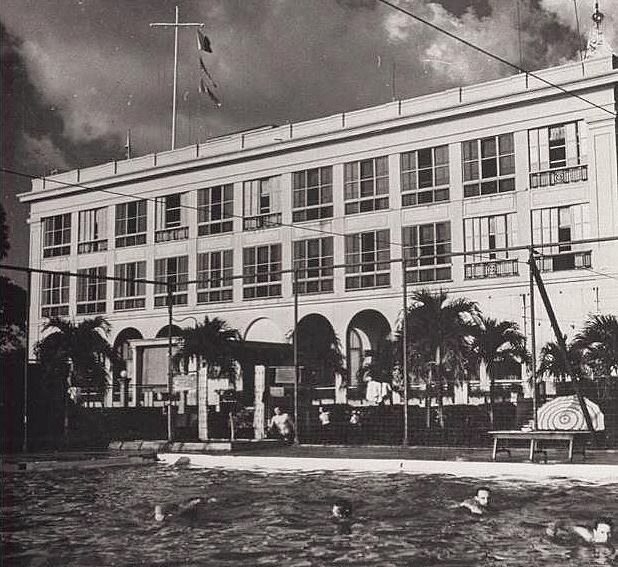 It appears that another landmark icon, the Army Navy Club is being torn down – following a continuing trend that, if continued, will eventually obliterate all evidence of the glory of Manila’s past. I asked myself why ? Even as the ANC was designated as an historic site, decisions were made apparently behind the scenes and the demolishers are working feverishly to wipe these buildings from our collective memories. What’s next ? The Manila Hotel ? In my article, I pay tribute to one of the oldest buildings from the American colonial period with the hope that by documenting it, we will somehow keep its spirit alive. 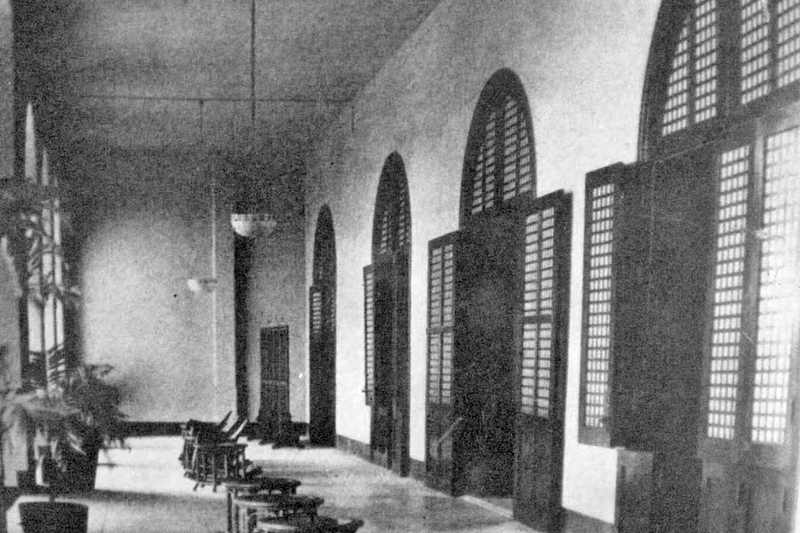 Social clubs were almost all there was in Manila for entertainment, dining, and even lodging when the Americans arrived in 1898. 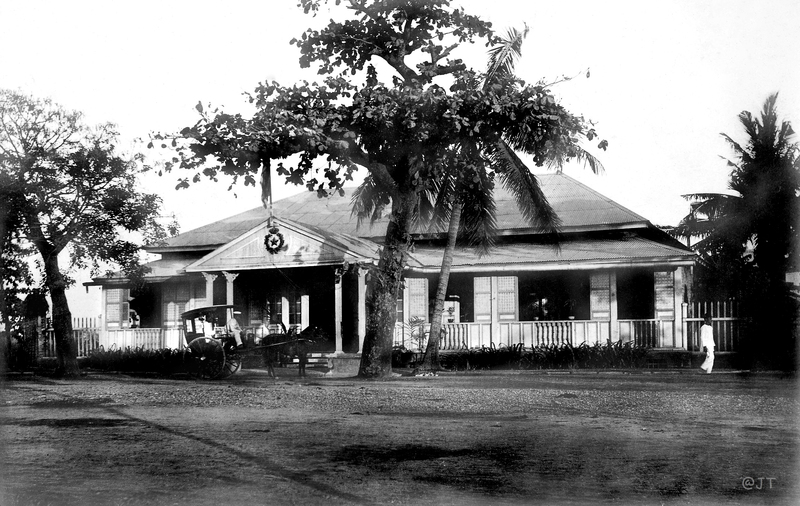 It’s not quite documented exactly when the ANC was founded although there is mention of an Army Navy club in Manila as early as 1898 but definitely by 1899, a club was located on the corner of Bagumbayan (P.Burgos) and Nozaleda (General Luna) where it remained for another year and a half. It was furnished quite nicely with a bar (of course), dining room, billiard and poolroom. In mid-1900, the club was moved back to Intramuros into a large one-story building taking up a full block at Potenciano and Palacio streets – directly across the San Augustine church (photo below). It featured a large courtyard filled with trees, coconut palms, tropical plants and even orchids. The clubhouse had a bar, separate men’s and women’s dining rooms, pool and billiard room and several bedrooms for guests. 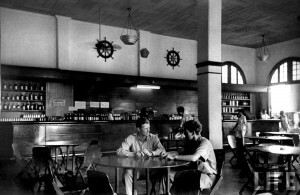 It was primarily a men’s club for the military but it quickly grew popular and became the social center for the American expats longing for a touch of “home”. Even more significant, the ANC was used by the civilian Insular authorities for entertaining both foreign and American dignitaries. 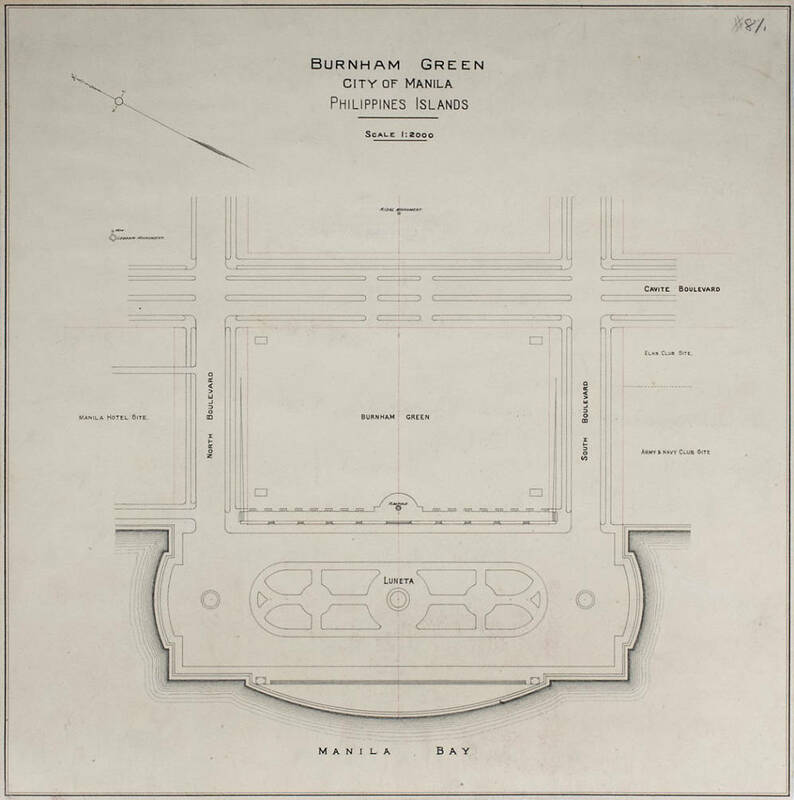 It was about this time that the waterfront around the Luneta was filled in according to the Burnham plan, being called the Luneta extension. This left an excellent location for a site for the club because the new facilities could include tennis courts and even a dock to accommodate offloading Navy shipmen. Another attraction was the offer of the Municipal Board to exempt tax payments for several years. It was, as they say, a “no-brainer” ! 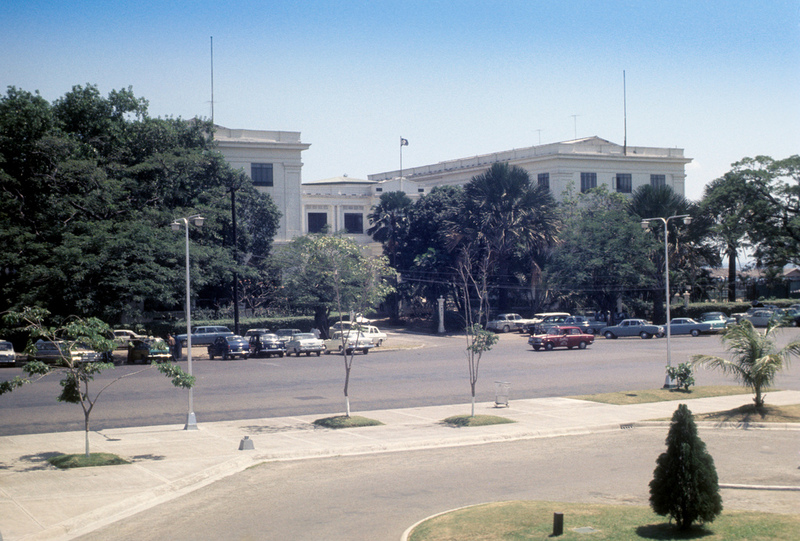 The Luneta is shown below prior to the land fill (looking south). Luneta c.1899-before the reclamation which added the Luneta extension. In 1904 and 1905 Daniel Burnham completed his renewal plan for Manila (& Baguio) for the Philippine Commission. It would extend about one thousand feet into Manila Bay, allowing for beautiful public playgrounds and picnic grounds, flanked on either side by impressive governmental buildings. The extension aimed to form a natural starting point for a 250 foot-wide continuous bay-front boulevard for infinite views of the ocean and sky. Renaming the existing Cavite Boulevard to Dewey Boulevard to honor American naval admiral George Dewey, this 12 mile stretch was intended to contain driveways, parkways, and perhaps even a bridle path for horse carriages. 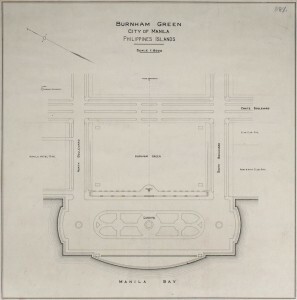 His plan included the Burnham Green (below) which provided more space for the Manila Hotel , the Elks Club, and the Army Navy Club. In the meantime at the ANC, plans were drawn up, funds were raised, and a design by William Parsons was selected. At a cost of about ₱300,000 and covering an area of 135,500 square feet, the building followed an “H” pattern with two wings and a center building. It was built to be practically fireproof, with pillars and partition walls of reinforced concrete, ceilings of steel or concrete, and floors of tile except in the dining rooms and sleeping rooms. On December 29, 1908, the City of Manila sold to the Army and Navy Club 12,665.46 sq.meters for ₱4.04/sq.meter. 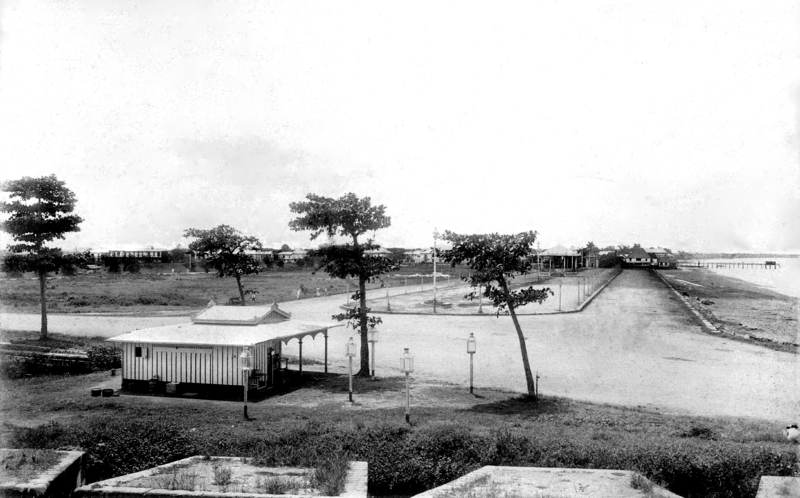 Even as the new landfill settled, construction started and took most of 1909 through 1911 and on April 17, 1911 a grand parade comprised of politicos, ANC members, Manila policemen, old soldiers, and a large contingent of the U.S. Navy, led by the 20th Infantry band, marched from the old club to its new digs in the Luneta. Members were asked to tote memorabilia from the old club to the new. Befitting an inauguration of royalty, the buildings were lit by a mass of electric lights. The reception took place at 10pm with Gen. Bell and Col. Lauchhieimer, President of the Club, receiving guests. After the reception, the guests filled the corridors…flashing with myriads of electric lights and decorated with flag and palms. The guests danced away the evening with music provided by the 20th Infantry band. Alas, the euphoria of the new quarters faded as antagonism grew between civilians and military with the arrival of newly appointed Governor F.B.Harrison, who perceived a feeling of anti-Filipinism that unfortunately continued up through the start of WWII. Even the wives and children exhibited an air of elitism. As WWI commenced, many of the American military were transferred to the European theater of operations which greatly reduced the social activities at the club. I have to add that this air of discrimination was not peculiar to the ANC. 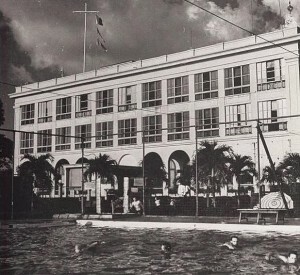 It was evident in other clubs such as the University Club, the Manila Polo Club, the Manila Hotel and even at cabarets such as John Canson’s Santa Ana Cabaret. 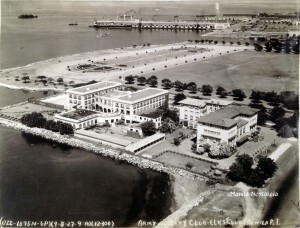 By 1921, with the return of the military as well as the U.S. Asiatic Fleet in Manila Bay, the club grew to be the largest in the city with 735 members. 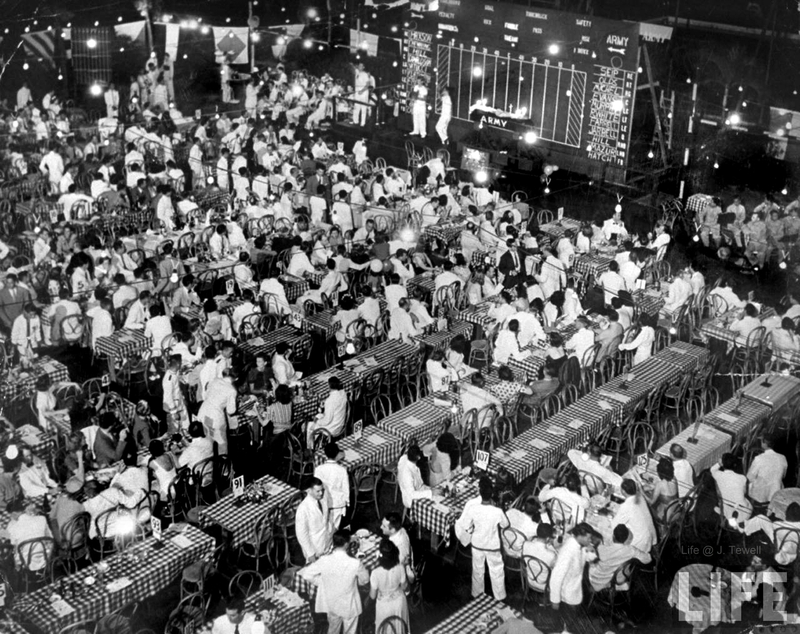 The Twenties marked an increase in social activities at the ANC. 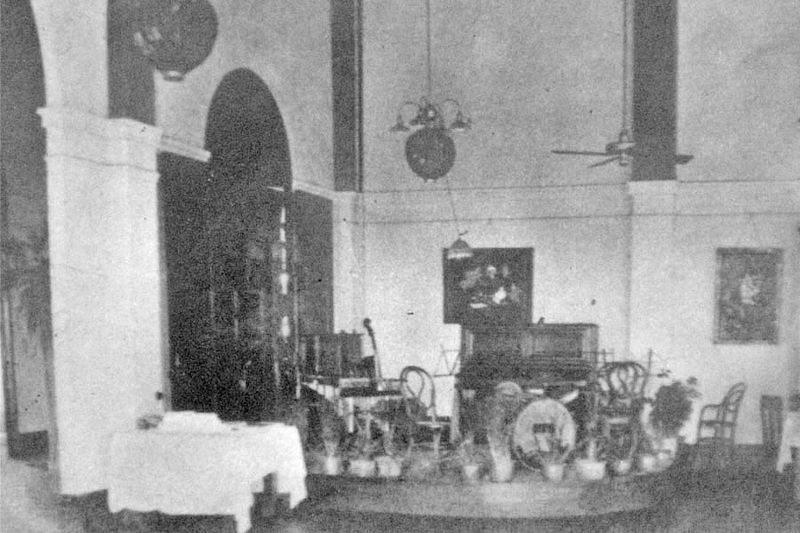 The reception room with a distinctively Oriental flair was the most beautiful room at the club and a source of pride, especially for the women members. Membership was extended to all officers of the U.S. Armed forces both active and retired, to service nurses, and “to a carefully screened group of American business and professional men residing in the Philippines. Restricted membership was allowed certain foreign officials. Honorary memberships were extended to the American High Commissioner and the President of the Philippines”. 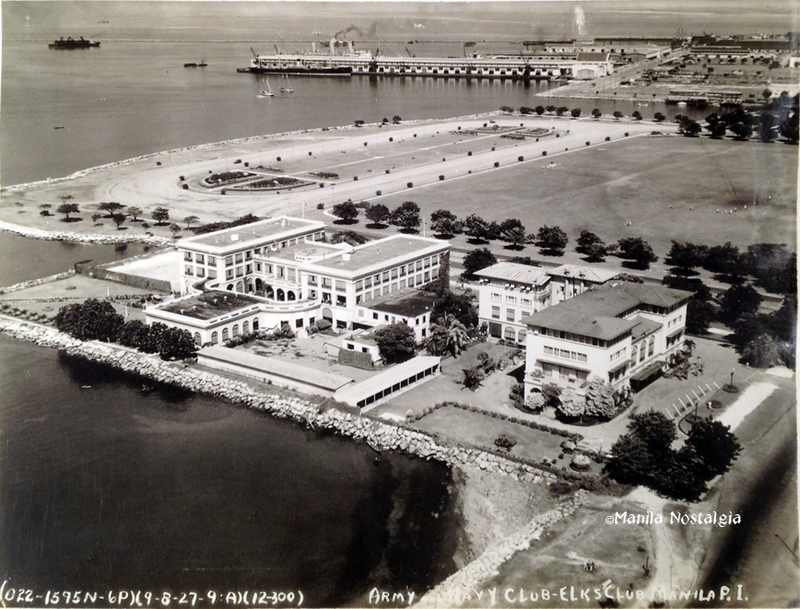 Manila was probably one of the best assignments for the military in the Thirties because of the friendly and hospitable atmosphere of the Filipinos combined with the excellent facilities at Subic Bay, Sangley Point and especially the Army Navy Club. On the second and third floors there were seventy furnished rooms with a wash basin and running water; shared showers down the hall, cots were available for ₱2.00 a night. The bar was in the left wing and across the bar was a mens’ dining room with a barber shop and shoeshine stand at the end of the corridor. Free peanuts, crackers and cheese spread with a free lunch in the afternoon was available at the bar. Favorite drinks were San Miguel beer on tap served in frosted beer mugs and bar Scotch. Oh yes, this was truly a choice assignment. The main dining room was in the east wing and served officers only. 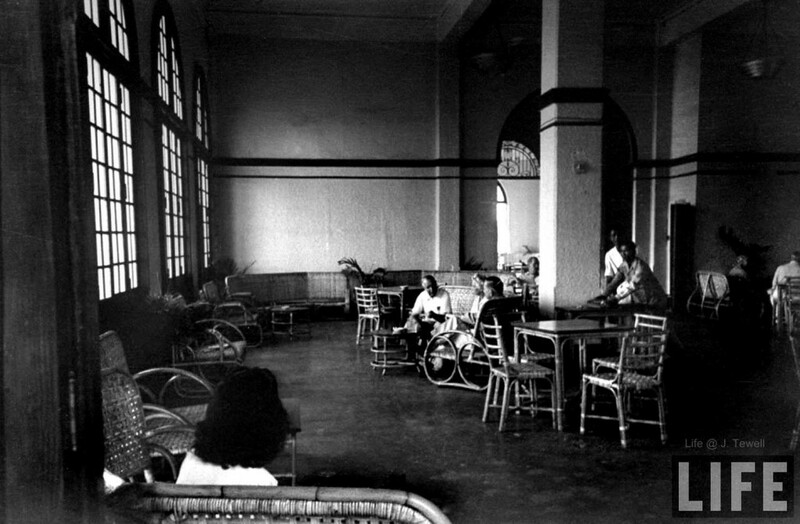 The pavilion, which faced Manila Bay, also served dinners to the officers, ladies and guests and where the dance orchestra entertained until after midnight. 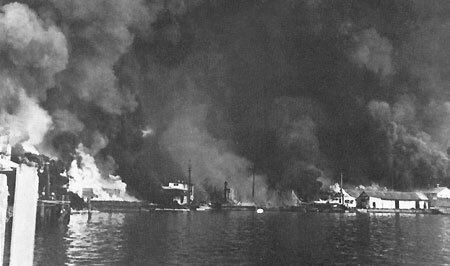 As the war in Europe raged on, inevitably dragging the United States into conflict and Japan increasing their hold in China, the Navy started evacuating all dependents in November 1940; the Army followed suit and by February 1941, the evacuation was complete, leaving only American civilians in Manila. Social activities naturally drew down. 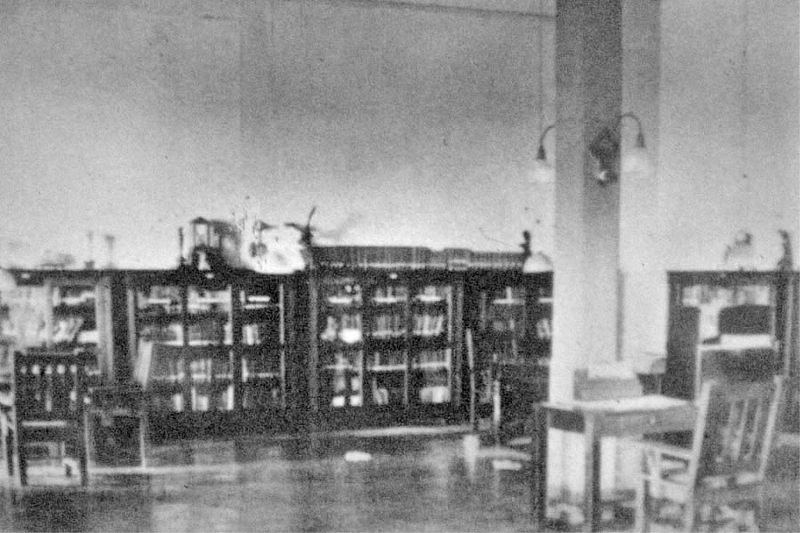 The attack of Pearl Harbor and the ensuing bombing of Manila and military targets, the ANC basement was turned into a bomb shelter for both day and night accommodation. The band in the pavilion had long ceased to play; the dance floor stacked with officers’ trunks and belongings. Fortunatelyl, the club was spared by bombs even as they were dropped on nearby buildings in the port area. Many of the dying and wounded from the Naval Yard in Cavite were brought to the ANC. Air raids continued until December 26th when Manila was declared an Open City however that didn’t stop the Japanese to continue their bombing forays until they marched into Manila on January 2nd, 1942. The next day, the Red Sun flew over the Army and Navy Club. 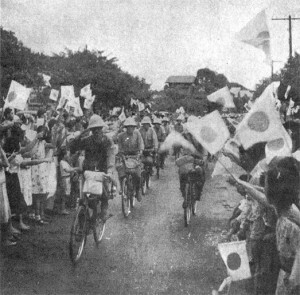 After the surrender, there were parades in Manila in front of MacArthur’s old quarters at the Manila Hotel to celebrate the Japanese victory. 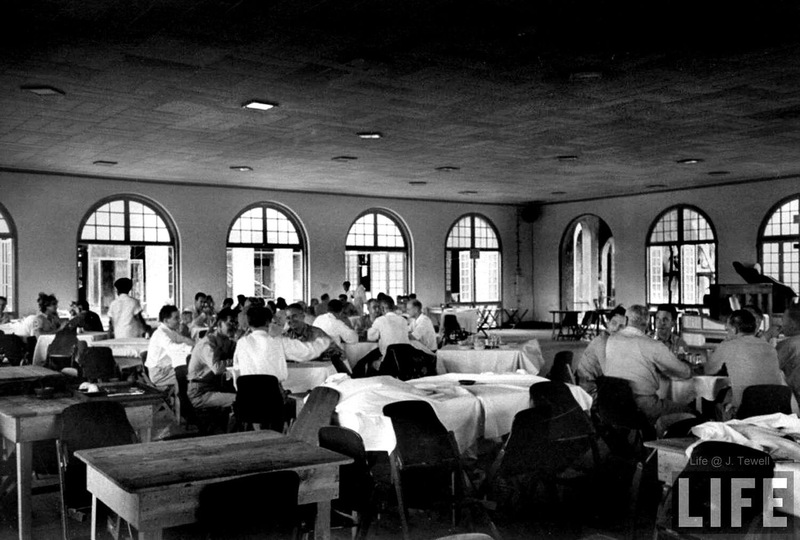 While tens of thousands of POWs were marched to Camp O’Donnell under horrendous conditions, the senior Japanese officers were toasted at dinner in the old American Army-Navy Club. The Americans returned to Manila in February 1945. 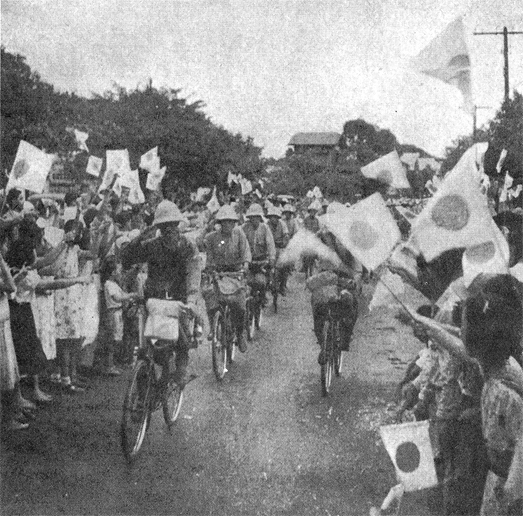 They were met with much resistance, fighting their way often times door-to-door to vanquish the Japanese. 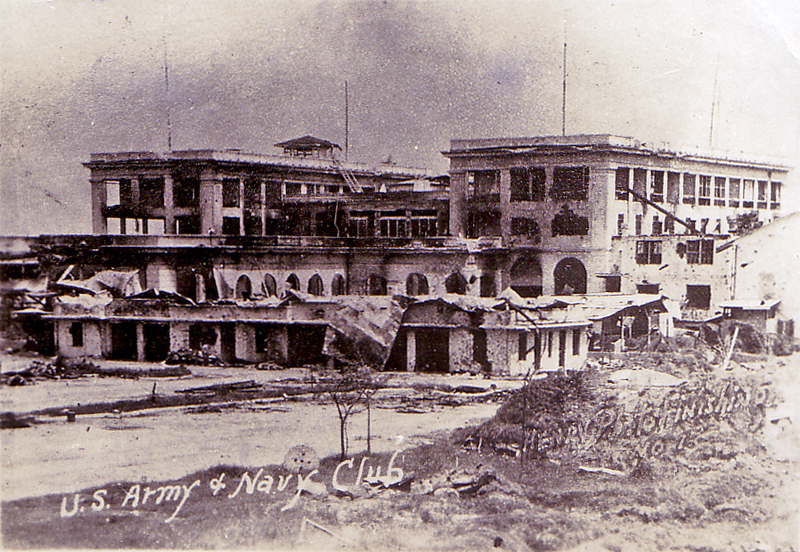 It is reported that during the Battle of Manila, the two club buildings were garrisoned by Rear Admiral Iwabuchi’s Headquarters Sector Unit and the Manila Naval Defense Force commander apparently used the Army-Navy Club as his command post for some time. Using land mines and flaming barrels of oil, the Japanese defenders burnt out the building and destroyed the roof and pavilion along with one wall of the swimming pool. The Army and Sea Bees (Engineering Corps) patched up the building which was partially completed by December 1, 1945, just in time for the Club to reopen and broadcast the Army-Navy game. Setting the right priorities was important ! 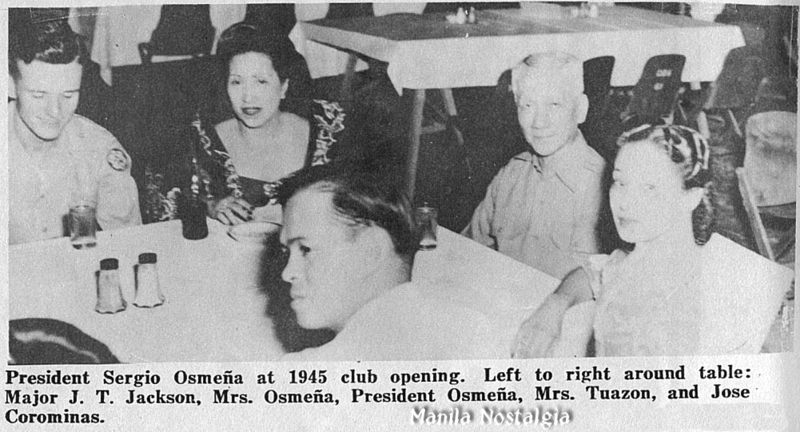 The photo below shows President Osmeña at the formal club’s opening on December 2, 1945. It was truly a low point for the ANC. The general consensus was that the club had outlived its usefulness and should be sold; suggested buyers included the U.S. State Department, the City of Manila or the owners of the Jai Alai. Well, we know what happened to the Jai Alai so that would have been a poor choice. Somehow a triumvirate of Admiral Morrill, Col. Evans, and Lou Wagner’s civilian group managed to save the club from dissolution. It was at that time the decision was made to “civilianize” the club. Thus the recruiting of civilians started in earnest, regardless of the previous military experience which had been a criteria in the past. Newland “Ned” Baldwin took over as Club President in 1952 with a new direction. The Club would offer the same kind of family club environment as the pre-war club but with a greatly expanded civilianized and Filipinized membership. By 1955, ANC membership was roughly 27% U.S. military, 44% American civilians, 15% Filipinos and 11% other nationalities. 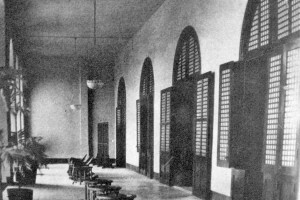 One important aspect to improve the Club’s finances was a contract signed with the Manila Theater Guild for the use of the large ballroom as a theater. The MTG had its origins in the pre-war Community Players and had previously staged their plays at the Masonic Temple. 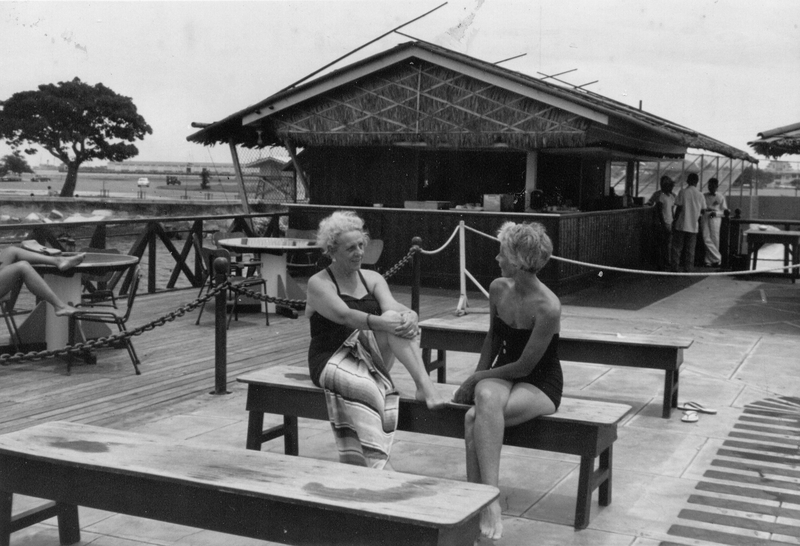 In 1951, it accepted an invitation from the ANC to build a stage at the south end of the club ballroom. This arrangement worked out so well for both sides that in 1953, a new agreement was reached between the parties for a five-year rental, with an option to extend for five more years. A non-profit group, actors and actresses received no pay and most props and settings were donated by firms – local and multinationals in the name of art and culture. The Guild put on 5 to 6 plays a year and was so enthusiastically supported that its budget was consistently in surplus. This meant that its stage equipment was more sophisticated than that of the typical community group and the shows qualified as professional, though nobody was paid for services. Tickets were ₱5.00 ($2.50) each and every night was usually sold out. The Guild supplemented ticket income with sales of advertising in programs. Elaborate publicity photos were placed in Manila’s four English-language newspapers. 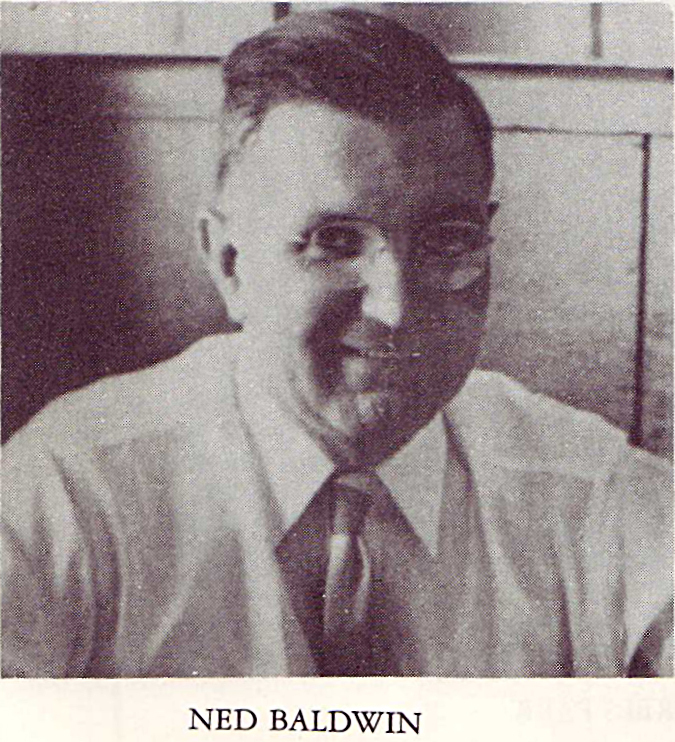 “Dave Harvey” McTurk, shown below, was a guiding force at the Guild as well as its Publicity Chairman. He had been an entertainer in Shanghai in 1939 and left when the Japanese invaded that city only to be interned later by the Japanese at Santo Tomas during the occupation. He died in Manila in 1972 at the age of 67. Director Bill Kane on the left with Gertrude Stewart who was renown as a cook, author, and entrepreneur in Manila. In the mid-Fifties, under the management of Arno Duchstein, the Club began to evolve from a men’s service club to family oriented activities. The club became once again so successful that prospective members were placed on a waiting list of several months and the membership also changed in composition, including over 40 nationalities. Continuing along the direction of a family-oriented club, the game room was transformed into a teen room. The kiddies’ Easter Egg Hunt was so popular, it had to be limited to members’ children only. 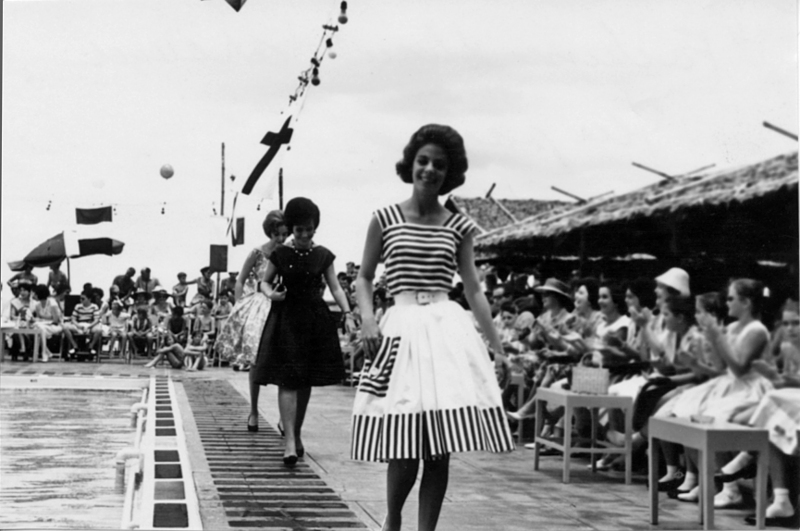 The Spring Festival of 1961 featuring swimming, tennis, and a ball was so successful that it was repeated in 1962 and 1963. The highlight was an outdoor fashion show. 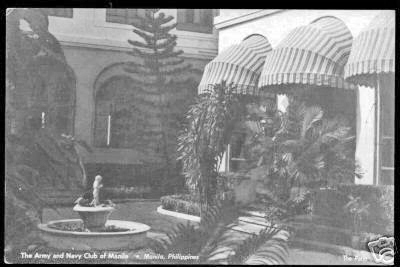 Filipino membership in the club increased during the late Fifties and early Sixties as American membership declined and by the Seventies, the club had been converted from the original American service club to a Filipino club, now admitting members of the Philippine Armed Forces to regular membership. Alas, the popularity of the club continued to dwindle as U.S. Embassy and military personnel now frequented the facilities and Post Exchange at the new SeaFront located at the former Manila Polo Club site in Pasay. Also, more and more members were relocating towards the new business centers and residential areas in Makati, closer to the Polo Club in Forbes Park. 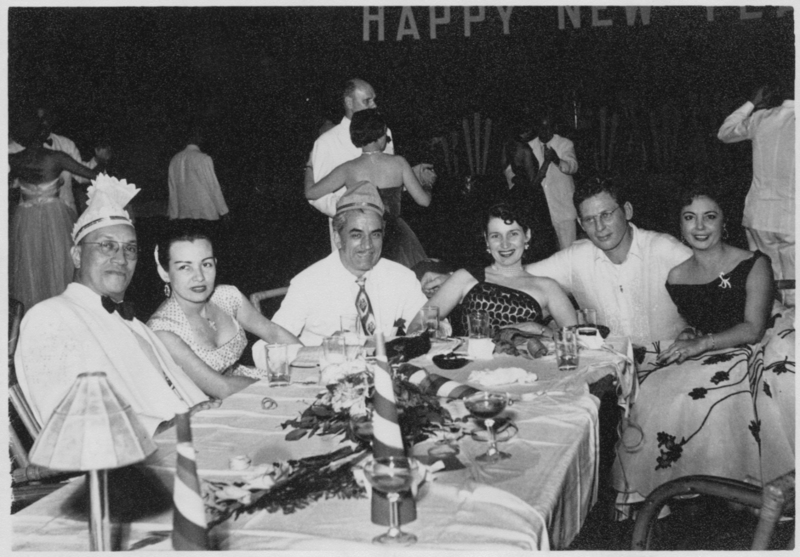 The annual New Year’s Eve party was always well attended – an event everyone looked forward to. “The parties were held in the ballroom which was packed with tables, people, noise, streamers and a live band. Tickets were sold – and I cannot tell you about that because, naturally, my date would get stuck with that chore. Girls were always in dresses made or bought just for that night and the men wore white dinner jackets. The idea was to be there, come hell or high water, for the countdown to midnight. The lights would be dimmed or maybe even turned off, the band would play “Auld Lang Syne and there would be the occasional flash of camera bulbs to illuminate the darkness and then a roar of “Happy New Year!!! “The lights would suddenly come back on, and hopefully you would in the arms of your date when they did! To pit against the thing that’s sure to come. Who love this grand old Club will not be here. The whistle blows! I must be going now. Farewell, old Army and Navy Club, farewell! The city finally took over the property in the early 1980s and for a while it housed the city architect’s office until the crumbling building forced its occupants out. Afterward, the once-grand structure was used as a manufacturing place for the city’s Christmas lanterns. The building decayed further, nearly to the point of no return. Then the city took action. It was resurrected as the Museo de Manila, but after a grand opening, it quickly closed its doors. It lasted over a hundred years but in the end, we can only blame ourselves. There was no effort to revitalize that structure nor rebuild those crumbling walls. Now those walls are down and we cry with self pity but as Carole King wrote, “It’s too late baby !” Let’s try to save some of the other buildings in our beautiful city before it’s too late for them too. For now, we still have our memories. My maiden name was Goldman. My parents, Ed and Lore Goldman met on a tennis court at the Army Navy Club in 1937. My mother and her family has escaped from Germany and landed in Manilla. My father was in the film business, doing distribution for Columbia Pictures in the Far East. They were married in 1938 and my brother was born in 1939. My father was one of the “Lost Tribe of the Philippines”, having been interned during the war in a Japanese concentration camp. After the war – I was born. We stayed in Manilla until 1953, when my father was relocated to Japan. 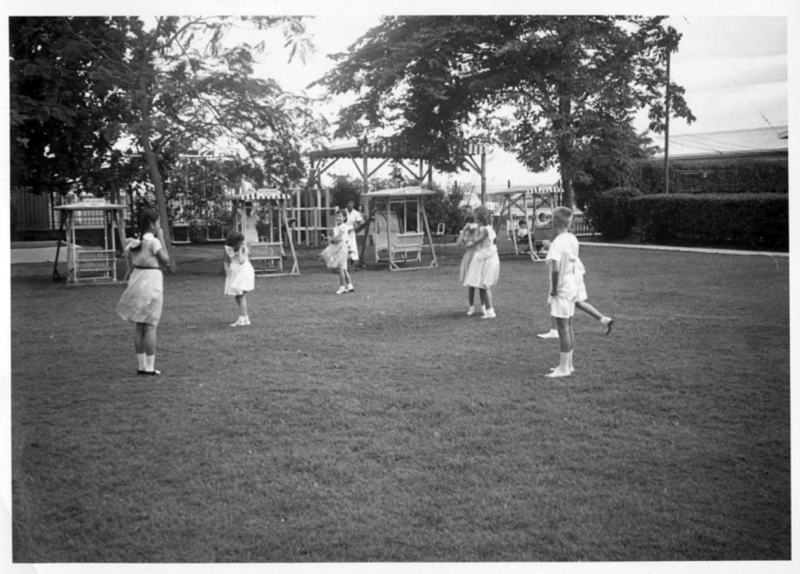 My Aunt and cousins, the Kaufmanns, stayed in Manilla until 1957, when they came to the United States so my cousins could attend American universities. I have many photos of my parents partying it up at the Army Navy Club. It was their second home. Excellent article Lou. My family were member from 1963 to 1976. I have many fond memories of the old ANC. I had a birthday party there when I was 10 years old, I believe. I would spend afternoons in the library and Saturdays at the pool. The old MTG was one of the first venues that kindled my interest in theater and acting. I had the good fortune to have watched Dave Harvey on stage as Scrooge in “A Christmas Carol.” My father introduced me to Charles Lindhberg, who used to stay there on visits in the ’70’s. Your article was well researched and well illustrated! I have been posting about this destruction of ANC as early as June when I was barred by security guard from taking photos of the place. Maybe I should have made my noise a little louder. I dont think the NHCP is cleanhanded behind the demolition. So nice to hear more on MANILA NOSTALGIA, Lou… this long awaited continuation of your well-researched masterpieces. Please never stop ! Don’t we all love old photos. Truly nostalgic, Lou, as you even included picture #30 of “The Silver Whistle” Manila Theatre Guilds play starring Luisa Lichauco, seated on the far left of the photo. Lui was my sister Soly’s best friend, before Soly passed away in 1964. 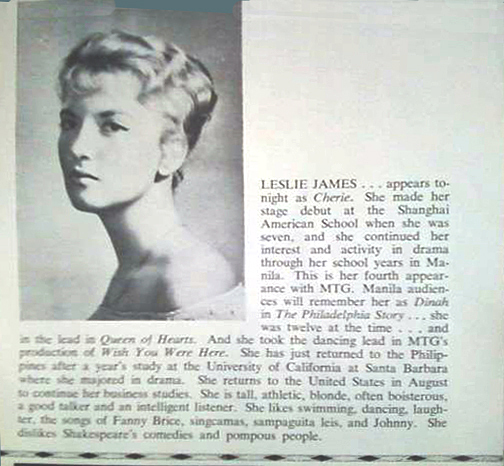 “Miss Lichauco” was our American History teacher in Maryknoll. Lui later became a Maryknoll nun, Sister Marisa Lichauco, also a foundress of House Without Steps, or something like Bahay Walang Hagdanan for the poor and disabled. Yes, so sad to hear that the historical Army & Navy Club is being demolished for yet another high-rise condo, hotel or casino – a tall, multi-storied structure on soft, reclaimed land !!! What are they thinking? Thank you for another great article Lou. It’s true to a certain extent that we have only ourselves to blame, but there are factors that is just far beyond our means and influence too. 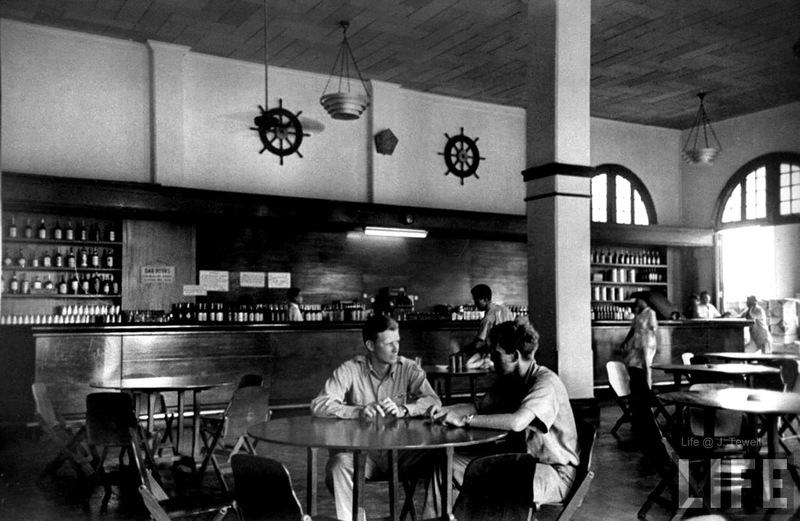 The Army Navy Club was my second home for many years, from the early seventies into the early nineties. A great number of my lifelong friends I met at the club, and who can forget the club employees who were like a second family to many of us? “Missy, I got chickie livers for you.” evokes memories of the waiters of my time at Army Navy who often made an extra effort. I remember their faces to this day, and some, in spite of my poor memory, their names too. Boni, Bote, Atido.. And there were the locker attendants, the ballboys, the staff from the poolside and tennis courts, the lifeguards, the telephone operators in the old style manually operated interchange, the librarian, the doorman looking smart in his doublebreasted tunic, the bartenders and even the barbers in the barbershop at the end of the long hallway lined with crests from ships of the 7th Fleet. I remember the notices that were painstakingly hand painted from a time before computer printers came into being. Looking at the photos above, does anyone recall a Mr. Howie? He looks like the fellow wearing glasses in the rightmost corner of the photo of the Men’s Bar. A meal at the Crimson Room always made one feel special, and there’s the swordfish on the wall of the Anchor Bar where children were not allowed, but wherein one could sneak into via a “secret passage” beneath the stage in the Pavilion. The Army Navy Club held some of the most cherished memories of my childhood, its library, once known as one of Manila’s most extensive, is where I donated many of my books too, in the mistaken notion that the club would last forever. Alas, nothing does, for some things are really much bigger than we are. And often, we learn to let go, painful as it is, as there really is no other choice. But thank you for the memories, for nothing short of death or impairment can take that away from us. And thank you Lou, for documenting them for us. Great article Lou. Still cannot believe that they basically just demolished the old place. They had the best calamansit juice. YES! The calamansi juice was my favorite in all of Manila. But I also remember the hamburgers at the pool. It was my weekend treat to go to the club and have a burger. My dad was an officer in the CG and he was stationed at Sangley Point. We went many weekends to Manila to the ANC and I will never forget it. As usual, another wonderful article. I think I enjoyed it more than others because of the personal connection. I read it twice on on two different days to make sure I digested as much as possible and will probably read it a few more times over the next fee weeks. You helped fill in some things I never even thought about. I didn’t know it as non-military when most of us went there. My stepfather was considered “military” because he was the one working under a military contract at his US engineering firm and so we had military base privileges. My family were never members of the ANC while it was still around and thus I never got to enter its premises but I’ve always admired its beautiful buildings from afar. Even though I never got to savor the benefits of its membership, as a Filipino, I was still proud of it being present in the city I love. I join all of you here who are saddened by its impending demise. Though it’s physicall gone, it lives on in our collective memory. My mother told me that , at least during the 60s and 70s the upstairs rooms were run by the YMCA. Best New Year’s Eve parties! Happy memories. I am writing a book about a father and son killed in World War II. From 1939 to 1941, the family lived in Manila at 1237 M.H. del Pilar in an apartment building. I believe their apartment overlooked the Military Plaza. I am looking for incidental information about the neighborhood during this time and about the general lives of U.S. Army families, including a teenage son. Also, the father was an officer whose office was in Fort Santiago. How would an officer typically get from his home on M.H. del Pilar to Fort Santiago? Trolley? Drive? Walk? Many thanks for any and all information. 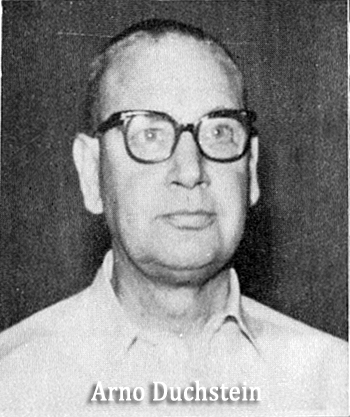 My late father, Ed Bryan was a life member as was his father before him. I always looked forward to lunch and then the pool, or tennis. Mother and Father attended the New Years party many, many times. 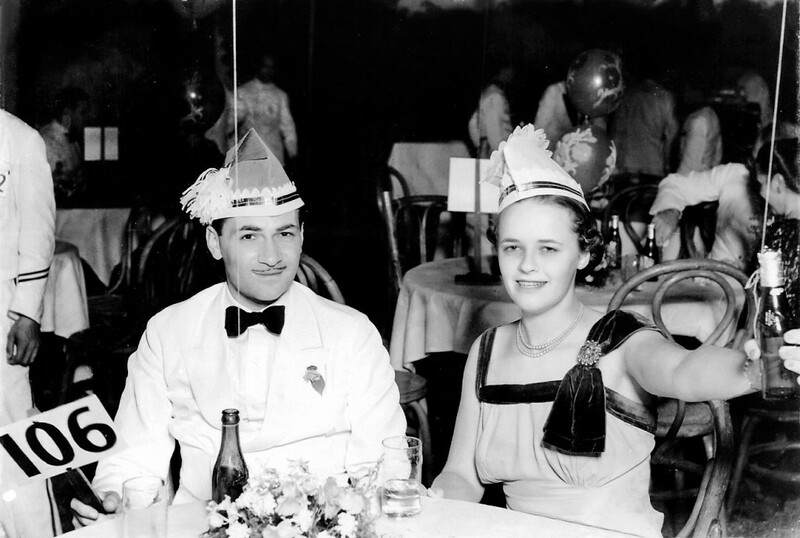 I have a picture somewhere of my parents and George and Gene Evans having a grand time at a ’50s New Years party. Thank you Lou Gopal for bringing back such fond memories! Hi, I am Michelle Duchstein from Germany. My Grandfather was Arno Duchstein. He told us a lot of stories about his time at the Hotel. Thank you for this artikel. Hi Michelle; I just read your note re your grandfather. Your grandmother (we called her Tita Carmen) was a close friend of the family. When I was in college, I tutored both Duchstein boys (Arno and Paul). Which one is your father? I have enjoyed reading every one of your articles on Manila Nostalgia Lou! Having lived there from 1950 to 1966 I still feel a strong affinity to Manila and the Phillipines! I have so many wonderful memories of my years there and many of them were created at the Army and Navy Club. I learned to swim there from Feddy, my family spent many weekends there enjoying all of it’s amenities and my Mom was a very active member of the MTG. She designed many of the costumes for their plays including Beckett, Dial M for Murder and many others. She also did the make up for many of their productions. Mom got me involved in several plays including playing Horace III int ” The Remarkable Mr. Penny packer and several rolls over the years in ” A Christmas Carol”. I wish that I could have sent you some of the pictures, programs etc., that my parents had however, sadly they have deteriorated over the years. Thank you for another wonderful article that helped me relive some of the happiest memories of my years in the P.I.! My one dream is to be able to return there once before my time in this life is over. I happen to live right across the boulevard and all that’s left of this remarkable building is the outermost structure. It appears to have been gutted out. 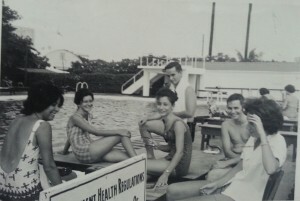 My dad has told me stories of how his father would take him and his brothers there to go swimming back in the day. Wish I could’ve seen it back in it’s hey-days! Also, I’m using your website as reference for my report on Old Manila for my English class. Thank you so much for this excellent article! Will definitely be reading up on the rest of the articles as well – there’s still so much to learn about my beloved city! Another great piece Lou. Very sad indeed. I can never forget the ambiance and being a part of history when I would go there. The Beatles did their first interview there. And of course the sumptuous breakfast after lounging by the pool and looking at the beautiful ladies. My father was a member of the ANC (we are from India). This is because we resided in Manila from 1961 and only left in 1990. I was born in 1961. My sister and I have fond memories of the ANC – swimming on Saturdays, the club sandwiches near the pool, the library where we had borrowed so many books. When I turned 18, I remember once in a way, we also went for the sandwich lunch at the Anchor Bar. Before I left Manila, I also had my residence for a couple of months in one of the residential rooms above. By that time, unfortunately the building had started to deteriorate and the management quite poor. Still, I spent the fortune and became a member. I then left for India permanently and until a few years back I was shocked that it was no longer there…….. The ANC was one of a kind. It possessed a somewhat anachronistic and faded but cozy glory even in the late 50s when I began going for swimming lessons with Freddy Cruz, holding onto his outstretched arms with other kids as he back-pedaled through the shallow end. 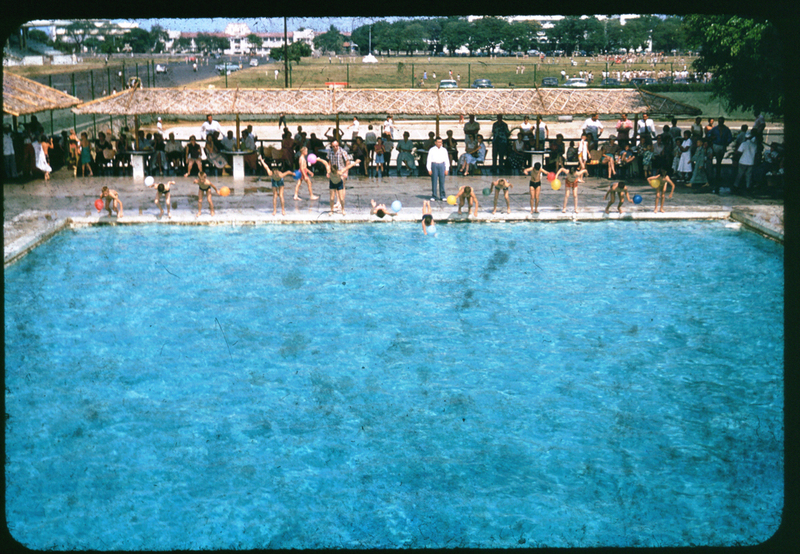 The pool always seemed to have cracks and missing pieces of mortar or cement. The reading room was serene, and even as a kid I enjoyed going through newspapers and magazines from all over. My father and I got our haircuts downstairs, and I remember the pungent after-cut eau de cologne (for lack of a better description) the barber slapped on. The circular driveway leading up to the entrance was narrow and surrounded by thick vegetation, as I recall. 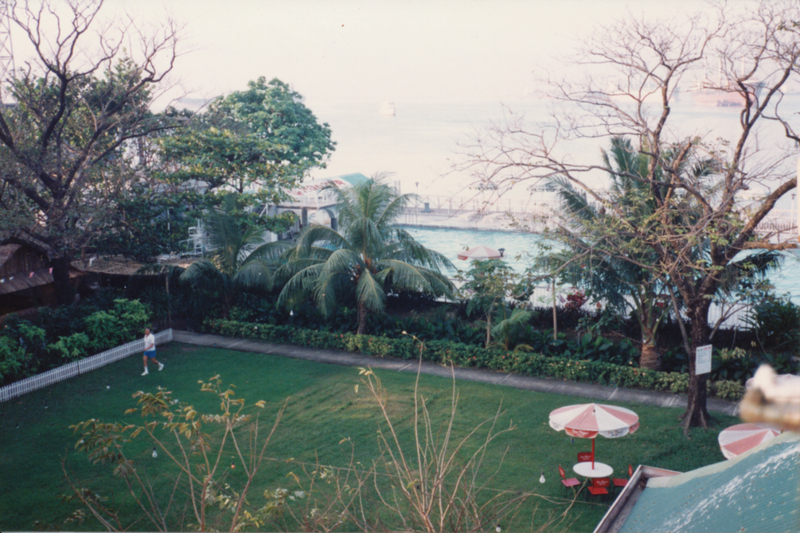 You could see often see Corregidor from the ocean side of the pool deck as well, and some of the sunsets were spectacular. Oh yes, the footwash pool going into the men’s locker room never seemed really clean, and I remember stepping over it to avoid it. The little things. Thanks again, Lou. Fond memories of many years at the Army Navy Club during the 60s! Great to see pics of Arno Duchstein and Gertrude Stewart (spent many nights at her place with her son, Alan). Thanks for posting this. Today I came across your blog for the first time. What a wonderful discovery – only sorry I hadn’t found it sooner. I was in the class of ’65 (American School, Makati). I left Manila the same year when my father was transferred to Kuala Lumpur, but once you’ve lived in the Philippines you’ll always carry it in your heart. Your research and documentation are treasures. My family belonged to the Army Navy Club. I took swimming lessons from Feddi, had my hair done – and first manicure! – in the salon. I remember the library. And the gift shop. Lena was one of the ladies who worked there and we have pictures taken of her and my sister on the front steps. Sitting by the pool looking out over Manila Bay with the sunburns to prove it. It was beautiful and gracious and seemed so much a part of Manila. I am so sad to know that it is gone. But thank you for capturing the history so eloquently. Susan’s comment just popped into my inbox this morning and I just wanted to add another comment, Lou. Your capturing so much of the history of Manila is wonderful. We lived in the Philippines for just four years, yet it remains so much a part of our lives with beautiful memories. I knew Nacho Marti and Yan and Mitch Schlachterman – old photos of them resurfaced when I moved recently. Does anyone know how they are and where they are? In a letter I received from Nacho he mentioned his plans to go to Australia. I have been sucked in and been reading your blog all day. 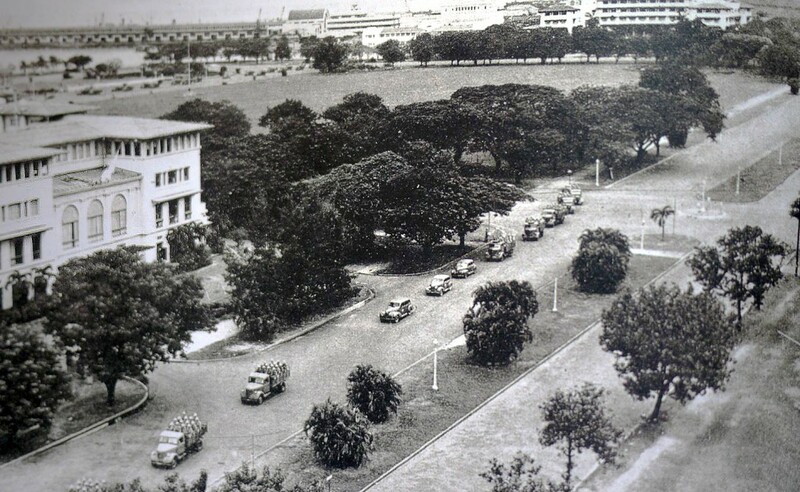 To see Manila in its heyday is amazing. But I think it is time to do a quick update to Army Navy Club page. What remains is currently being restored as a boutique hotel. I have been watching the work every day for two years happy to see that the building and property will be getting new life. I only hope the new tenants do justice to the historical significance. Cheers! Since I don’t live in Manila, I wonder if you might take pictures of the new construction and I’ll add it to my article ? I loved your article Lou! You said it so well. All the memories of the fun I had at the Army Navy Club, came flooding back! I remember Easter Egg hunts, sans rival, steak sandwiches, and their calamansi juice! I stumbled across your article because I was looking for calamansi recipes!!!! Lo and behold, I see responses from my older sister and classmates! And Lou, weren’t you on the running team too? I thoroughly enjoyed the tribute your article made to the memory of the ANC. I will miss it too. Great article, had many fond memories at the Army and Navy club in the 70s growing up in the Philippines. The huge vanilla milkshakes and burgers where amazing by the pools restaurant. Hello Lou, just found your blog looking around the internet to know something about the ANC so sad to hear such news but your blog is fantastic and brought so many memories…. I was born at the Manila Singian clinic in 1959 and lived in san marcelino st until 1972 when we came to Spain. Both my parents were born in the Philippines to Basque inmigrants I studied in the Assumption Convent . Another building that diesnt wxistanymore. Feddy was my swimming instructor and whenever someone comments on how well I swim I always think “thanks to Feddy. Does have anybody know he had an extensive old car collection? I think I have a picture of him with one of those cars from the 20’s. The Easter egg hunts, calamanco juice and french fries were simply the best. Multinational members and lots of languages is afine description. My first 3 year old friends in the army & navies sandbox were french ,Italian and English. So glad to have found your wonderfull blog. LauraFisher, how’s your sister Eluzabeth? I’m Roberto’s sister. Hello Ramon. Are the Clair Virata from my class at assumption? Thanks Lou. Thank you so much for these photos. I learned to swim and play tennis there. My father was an American GI during world war 2. My mother was Filipina (mestiza) and they married just after the war. I remember the boat launch to Sangley point that left from the pier next to the club each day. My mom would always want to go shop at the BX there. This is so sad. I spent my childhood through teen years in the Army Navy Club. As you climb the steps in the front entrance, a doorman dressed smartly with buttons on his uniform greeted you. You stepped inside and to your right was a sweet-smelling shop filled with American chocolates and magazines. I used to buy Chunky chocolate there and just sign for it. You go down the hallway that had old pictures of the ANC on both walls. To the left is the Sunset Lounge. To the right is the Ladies Lounge, Library and McArthur Room. You go down the steps to the tennis courts and a little to the left is an open garden. Up the steps is the swimming pool and outdoor restaurant. I remember everything– the Pavilion, the Anchor Bar (though I never stepped in there since I was only a kid). I remember the nice old smell of the building and the piped in big band music that always played in the speakers. There were two formal air-conditioned dining rooms too. It was restored. It turn out to be Rizal Park Hotel now. Joined the ANC in 1978. Took up residence 2nd floor corner room overlooking Manila Bay, tennis courts and Manila Hotel. Lived there for a year attending AIM Graduate School in Makati after separation from the Navy. Best of all times, now lost to history. Easy times by the bay sipping San Miguel or Calimanci with Ana & Heinz Brodheim, Bob F., Jon Van Aller, Carmen and all the ex-pats. On Easter, the sun set behind the Cross on top of Mt. Samat some 50 km across Manila Bay. The building was alive in Memories. Staff members had heart. The sad truth to the Club’s ruin lies in the fact members failed to pay their dues. 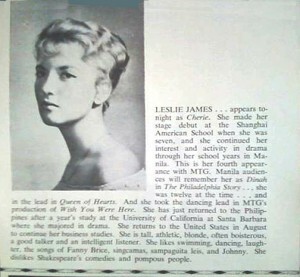 I auditioned for a role in a production in the early 70s of the Manila Theatre Guild at the Army Navy Club, steeled myself, read some lines, and sang as well. I must have rained out the better judgment of the audition judges. I thought they didn’t know talent when they saw one. I was about to exit when the door opened and suddenly I was face to face with someone familiar. In a soft voice, he asked, “Dito ang audition?” He was already doing radio and TV shows at the time. Later he became a showbiz matinee idol, appeared in movies, and did 45 rpm records. It might be contentious to say he and I had the same face, but for sure in that audition at the Club, we had the same fate. He was Rodel Naval.